IA, RI, ND – As construction of the Dakota Access Pipeline (DAPL) continues, water protectors are regularly engaging in direct actions in attempts to halt the progress of the pipeline. Simultaneously, during the week of October 17th, solidarity actions have been held in several states with direct resistance to pipeline construction continuing to occur in both Iowa and North Dakota. In Iowa, local news affiliate KFYRTV, reported a woman and her husband were arrested and charged with trespassing last Saturday after they blocked trucks carrying DAPL pipe across their farm. Cyndy Coppola says that Dakota Access is using her land without her consent and that her farm, along with eight others, is currently suing DAPL for seizing their land through condemnation court eminent domain, a process which they say took place improperly, in violation of Iowa law. This week, local authorities also announced that a fire causing up to $2 million in damage to DAPL construction equipment, suspected to be an act of arson, took place in Jasper County, Iowa. 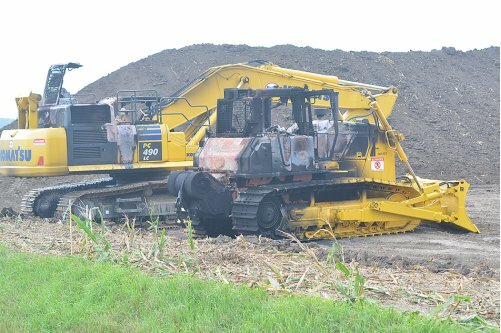 Several other fires, also believed to be deliberate arson of DAPL machinery, had previously broken out at pipeline work sites in Jasper and Mahaska counties in Iowa this summer. On the morning of October 20, in a direct action organized by the group The FANG Collective, people acting in solidarity with Standing Rock’s resistance to the Dakota Access Pipeline, locked themselves together to block the entrance to a TD Bank location in Providence, RI. TD Bank is one of the primary financial backers of Energy Transfer Partners, the primary corporation behind Dakota Access, LLC. Live video posted to Facebook shows two people locking arms with a lockbox outside the entrance to TD Bank, one of them attached directly to a concrete barrel. After the police and fire department arrive on scene, they eventually use a curtain to obscure the view of their attempts to dismantle the lockboxes. Laura and Steve, the two people who had locked down to block the entrance to TD Bank, were eventually extracted and arrested. “Today’s action targeting TD Bank, a major financier of the Dakota Access Pipeline, was done in solidarity with the front line indigenous resistance to the pipeline. In particular the action was done in solidarity with the Red Warrior Camp which was one of the first groups to deploy escalated nonviolent direct actions to halt construction of the project. Construction of the Dakota Access Pipeline is still underway in several states, including North Dakota. On Wednesday, October 19, Unicorn Riot documented construction work underway at a Dakota Access Pipeline work site off of Highway 6 in North Dakota, south of the town of St. Anthony. CLDC describes how the Morton County Sheriff, North Dakota Highway Patrol and supporting agencies have been closing roads to prevent protests from taking place, engaging in racial profiling against indigenous people, confiscating sacred objects, spreading baseless allegations of cattle slaughter and theft, and encouraging local farmers to “arm themselves” against water protectors. The report also states that law enforcement officers have not been wearing name plates or badge numbers, which CLDC says appears to be in violation of North Dakota law. Morton County Sheriff, North Dakota Highway Patrol, and Fargo Police, as well as National Guard in military fatigues in an unmarked SUV, were all seen on Highway 1806 near the resistance camps throughout the day of Thursday, October 20. A helicopter and single-engine aircraft continue to make regular, circling, low flights over the camp for many hours out of the day. Recently, press freedom organizations such as the Freedom of the Press Foundation and the Committee to Protect Journalists have issued statements denouncing the criminal charges that have been filed against journalists arrested while reporting on #NoDAPL direct actions. Four Unicorn Riot journalists continue to face prosecution resulting from our coverage of #NoDAPL protests in both Iowa and North Dakota. Actress Shailene Woodley, arrested while livestreaming a protest at a DAPL site in Morton County, ND on October 10, published an article about her arrest on Time.com today. The National Lawyers Guild has announced that while working with the American Civil Liberties Union of North Dakota, they have filed numerous records requests about what they call “unconstitutional surveillance” of #NoDAPL protests to a long list of law enforcement agencies whose personnel have been deployed against water protectors. Unicorn Riot has previously requested records demonstrating social media surveillance practices from North Dakota’s Department of Emergency Services (NDDES), who runs the state fusion center, only to have NDDES deny our request based on references to “trade secrets” and “public safety”. We continue to file records requests to various agencies involved in policing #NoDAPL direct actions- we have filed over thirty requests this week alone. March 29th, “Tribal Citizens Prepare to Blockade Bakken Oil Pipeline“; April 3rd, “Tribal Citizens Build Camp in Path of Oil Pipeline“; May 5th, “Sacred Stone Camp Resists Dakota Access Pipeline“; and May 27th, “Dakota Access Pipeline Blockade Enters 2nd Month“.